This entry was posted in fiction, genre comparison, methodology, point of view by tedunderwood. Bookmark the permalink. 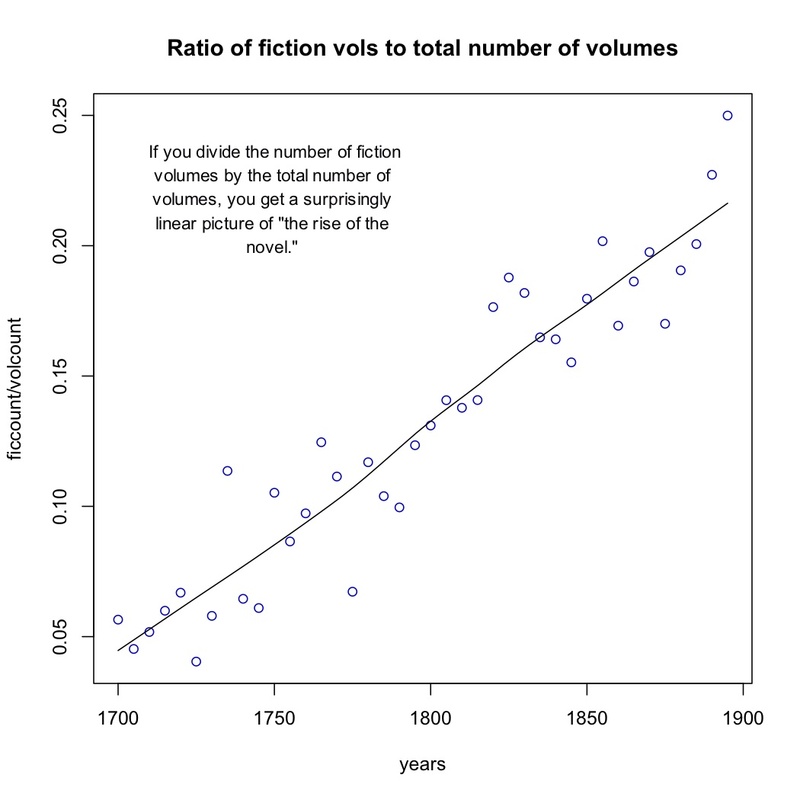 Your second chart shows a huge spike in number of volumes published under ‘fiction’ (threefold increase?) right at 1800. Both the first-person genre charts show a major discontinuity right at 1800. Are there just compositional changes in the dataset? For example, a hypothetical bibliographical explanation might be: the University of Michigan shelves fiction before 1800 in a special collections library: U of Calif doesn’t; U of Mich collected more genre fiction; genre fiction is more third person. Does that seem less likely than a major, overnight shift in narrative styles? 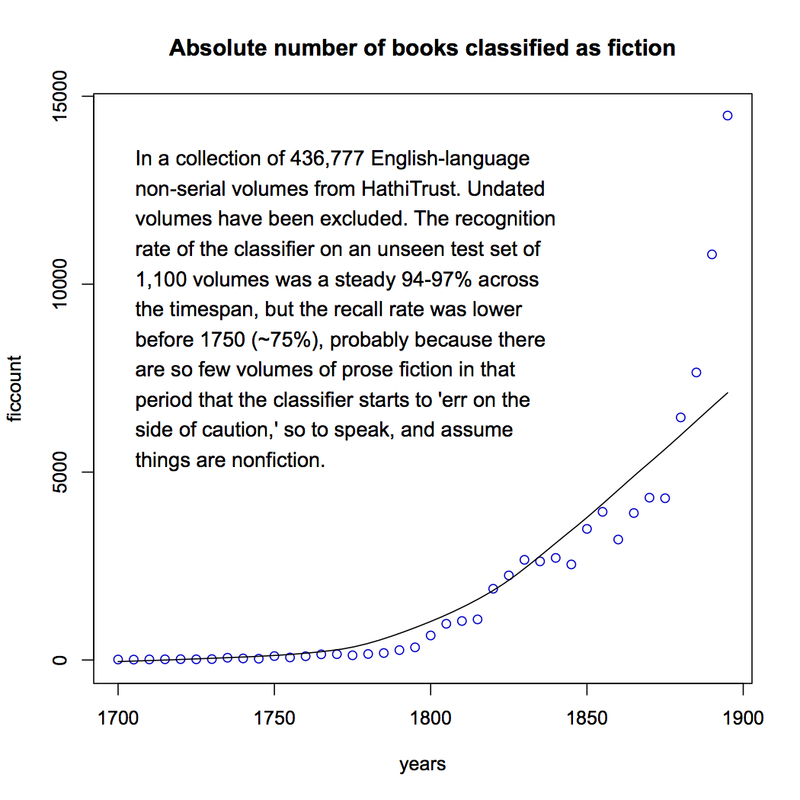 Just checked this in Ngrams: by one useful proxy, capitalized university names, there is indeed a major shift in library composition in the “English Fiction” corpus exactly at 1800 in Ngrams: California bookplates don’t exist in Ngrams fiction before 1800, but Michigan bookplates do. (The numbers are extremely small, but not all books from the library will have the bookplate). It’s possible that this is a side-effect of some change in library selection practices; I can’t rule that out yet. But it would have to be a rather large change, and a sustained one. I do think it’s likely that there’s some relation between the increased volume of fiction around 1800 and the increased reliance on third-person, but if you asked me to wager, I would put my money on a literary rather than bibliographical explanation. Incidentally, I suspect Google’s “English fiction” corpus isn’t comparable to what I’m working with here — because when I asked Harvard researchers about the composition of that dataset a couple of years ago, they conceded that it probably contained a fair amount of critical prose. 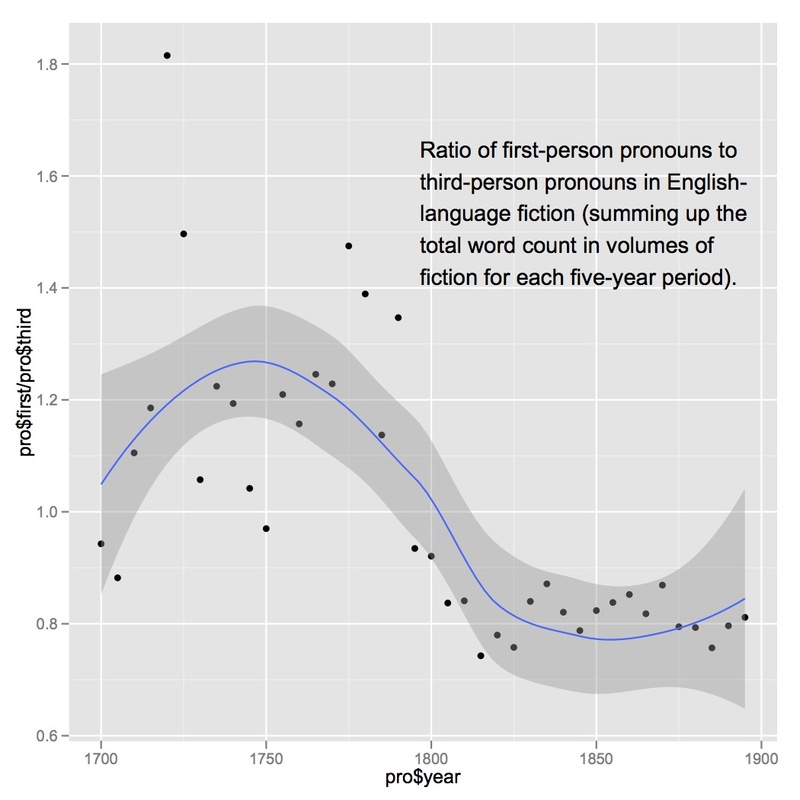 I’m not sure how the “English fiction” corpus was selected, but when I graph first- and third-person pronouns in that corpus, I don’t see a pattern comparable to what I show in my final graph above. Yeah, Google Fiction’s not the best proxy–thought I think it’s probably closer than the full Google set to what you have. But Hathi’s directly checkable, if not Hathi fiction: so… This is what I mean: some libraries (Harvard, NYPL) double their contributions from 1799 to 1801, and some (Princeton, Michigan) don’t. I suspect that’s only a manifestation of lots of other rules underneath about how university librarians have drawn arbitrary rules about the year 1800—some of which have got to be involved in the increase in fiction from 1795 to 1805 (much larger than Hathi’s overall increase) if not the first-person change. YES. We don’t know. For several years now my basic line has been that we don’t have descriptive control over our texts. Even at the level of close analysis of hand-picked individual texts, we don’t have descriptive control. Some years ago I read an essay by Monika Fludernik where she examined scene transitions in 50 British texts from medieval to early 20th century. She discovered a progression from explicitly signaled transitions–”And now we leave X and go to Y”–to implicit transitions where, upon a chapter break, the scene shifts from one place to another with no explicit marker. 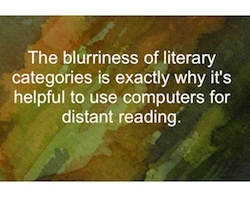 Rather, the reader is left to infer such a shift from what’s said. It seems plausible enough, but 50 texts is only 50 texts and when they are hand-picked from the canon, well, maybe such a transition is broad and general and maybe it’s an artifact of a hand-picked sample. Though it’s likely to be tricky, it seems to me that text mining might help here. And maybe the list of relevant features numbers in the 100s. Some will be amenable to current text mining methods, some not. But I do think there’s lots of work to do. 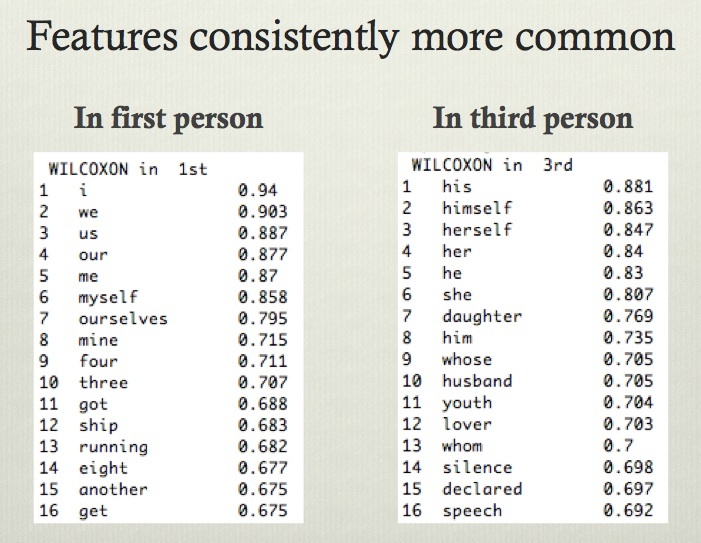 Idea that is conceptually interesting but/and more computationally complex and probably doesn’t improve anything: Elson, Dames, and McKeown reported a few years back that they could differentiate first- from third-person narration based on the size and degree of the algorithmically extracted social network in a text. Could be another approach to the same problem and/or a way to compare baseline results. The paper is at http://www.cs.columbia.edu/~delson/pubs/ACL2010-ElsonDamesMcKeown.pdf; my discussion at http://wp.me/pl9RM-aJ. Thanks, Matt — I had read that but forgotten it, and it might do a lot to explain otherwise puzzling things. Like, why does third-person narration tend to lean more heavily on words for social relationships (husband, daughter)? I see a bit of a conceptual or perhaps terminological issue here. On the one hand, you make a credible case that there are new facts and new knowledge to be uncovered with computational tools–a claim I agree with, and with which I agreed beforehand. But then you say that this new knowledge is something you call “literary history,” whose broad outlines you say “we don’t know.” But scholars and writers have known something they called literary history, and even worse, have operated as if that something were fact. Obviously limited both by canon formation and tool (and cognitive) limitations, scholars and perhaps even more importantly writers have operated as if what was in print, easily available, etc., does constitute literary history. I think the danger is in trying to map what you are discovering onto that existing category of literary history. We know from notebooks, prefaces, speeches, and many other sources what writers like James, Eliot, Joyce, etc., thought literary history was. They knew very little of that corpus that is now found in the Hathi Trust. I agree. Part of the reason we haven’t asked these seemingly basic questions is that our discipline had a basically evaluative goal for much of its 19c/20c history. I should note that in conversation at Univ. Nebraska – Lincoln, Laura White pointed out that Austen initially wrote Pride and Prejudice as an epistolary novel and redrafted it in the third person almost exactly at the moment where my graphs show a sudden shift in that direction. This seems to me a nice instance of the way focused, biographical studies and “distant reading” can usefully complement each other. I tend to suspect that innovations like free indirect discourse made third-person-omniscient more flexible and created a basically new equilibrium that favored it over first-person. I tend to suspect that innovations like free indirect discourse made third-person-omniscient more flexible and created a basically new equilibrium that favored it over first-person. What I like about about this line of thought is that it suggests a fundamentally aesthetic account of the change-over. It might also be useful to undertake a careful comparative description and analysis of the epistolary draft with the published version. I’m a student at UNL, but unfortunately I missed this talk. Pity… it looks really interesting. 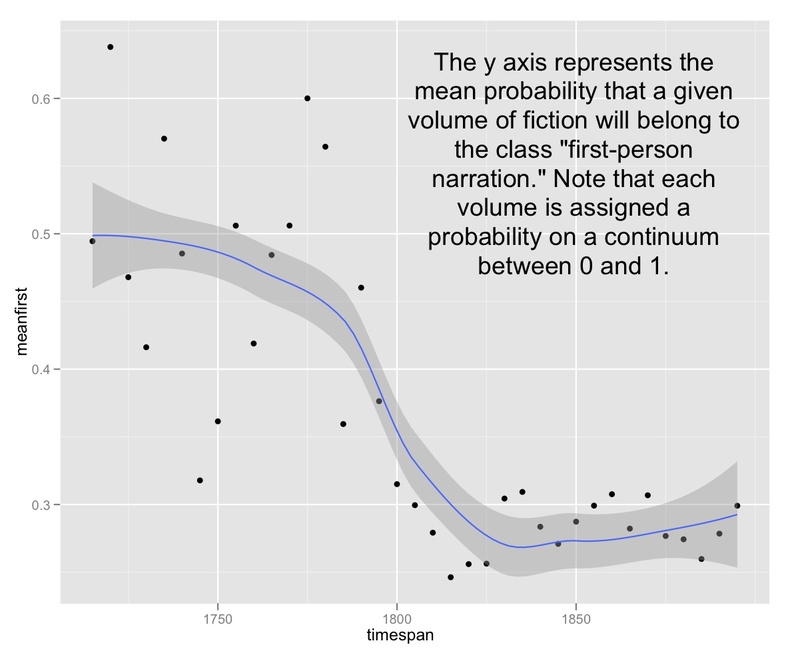 1) Prior to 1800, not only does the probability of classification change, but your standard deviation seems to skyrocket. Do you know why this is yet? Offhand, I’d be tempted to accuse the algorithms of getting muddled in changing vocabulary or grammatical norms, but it may very well be actual spread of the literature. I really have no appreciable experience with 18th century (or earlier) literature, so my guess may be way off the mark. 2) Your confusion matrix is very impressive; you’re predicting with 95% confidence or so. I was wondering though, have you so far only used single word identifiers? If phrases or context (such as constraining the analysis to words outside of quotations) where included, you might get even better results. I’m saying this because pronoun coupling with certain verbs might correlate with greater distinction than just the pronouns themselves, especially if you could normalize for such entities as direct quotation which may be first-person text within a third-person narrative (being that the character is speaking in first person). It would also be useful if the algorithm could search for keys like the protagonist’s name, but I don’t know how that could be used without manual input, which kind of ruins the point. Either way, this write-up was very interesting and informative; I really look forward to this research in the future. I’m now daydreaming about algorithms which could identify influential authors and regional trends. Also, yes, it would be nice to be able to exclude “direct discourse” — directly quoted speech. There are smaller corpora where that will be possible. It might also be nice to use bigrams, as you suggest. I would tend to frame these refinements less as a matter of “increasing accuracy” than as a way of exploring different possible definitions of “point of view.” I can imagine valid reasons to include or exclude narratorial asides, direct discourse, and so on — ideally, we’d do it both ways and compare. I recently just graduated from my undergrad so I’m not sure that I can add anything stunningly intellectual to this conversation just yet. I do think that these are really interesting questions and are things that I have never thought about before. If we would allow the computers to do a lot of our heavy lifting, I think we would find questions we never knew we had and answers that astounded us. Hopefully, as the humanities shift towards a more digital discipline, we will see more scholars asking these same/similar questions. I continue to think about the shift towards third person in the nineteenth century (as this is the area I will pursue in graduate school) and I want to know what it means. I keep making up stories about industrialization, identity, and urbanization in my mind as a way of explaining this sudden shift in narrative form. I can’t be sure that it’s true but I don’t think I would be able to rule it out. Congrats on graduation. Right now, I’m also “making up stories” to explain this shift. I trust some 19c grad students will come along to help us explain it! Thank you! I hope I’ll be able to make some impact on these types of questions once I finally get to graduate school. I think that we need to understand these types of questions because we don’t yet know the questions that this new information could unearth. We could discover aspects of “literary history” that we weren’t even aware existed… and that’s very exciting! Which is to say, new empirical discovers create the need for new theories, perhaps even new modes of theorizing. A lively and enlivening talk with some extremely interesting debate. 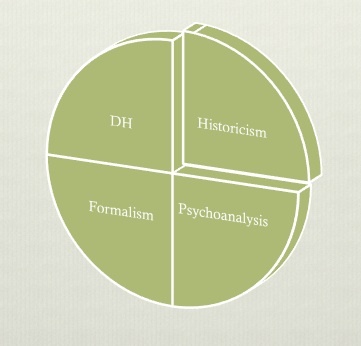 David Perkins in his book “Is Literary History Possible?” (Baltimore, 1992) has many pertinent arguments to advance about the philosophical permeability of traditional literary-historical categories. He also offers to explain the aporia that arises from attempting to historicize certain kinds of printed material (literary works) whose literariness is defined by its unsusceptibility to objective appraisal. A literary history is by its nature a contradiction in terms because works of literature, while created at some point in the past, exist meaningfully as literature only within the present. Such works are perpetually re-created as literature with each successive re-reading, this constituting a re-enactment in the present of a past experience that is now dead and gone with its author but remains available for re-creation via the printed page. There are many associated versions of this thought that pervade the philosophy of history as it applies to the history of texts, and profoundly important work by Gadamer, Jauss, and Ricoeur have much of value to say. In grappling with the aims, outcomes, and methods of a computerized analysis of a literary corpus, it appeared to me that a further philosophical nuancing of historical textuality would enhance the current research and help mediate its findings usefully to a highly theorized current discipline of literary studies. Thanks, Philip. As a Romanticist, I have a high regard for David Perkins, and I believe I glanced at ‘Is Literary History Possible?’ long ago in another life. I’ll take a second look.